The Nobel Prize is one of the most prestigious awards in the world. Luminaries that have received Nobel Prizes include Albert Einstein, Nelson Mandela, Ernest Hemingway, and Barack Obama. But the history of the Nobel Prize actually began because a wealthy Swedish industrialist living in Italy got to read his own obituary. The Nobel Institute Building in Oslo, Norway. Alfred Nobel was born in Stockholm, Sweden in October 1833. His father was a machinist who moved the family to St Petersburg, Russia, in 1842, and soon become wealthy by manufacturing weapons for the Tsarist Army. A child of privilege, young Alfred was privately tutored. He became fluent in French, Russian, German and English, and spent two years traveling in Europe and the United States before moving back to Sweden to open a small factory manufacturing nitroglycerin. At the time, nitroglycerin, a liquid made from glycerol and nitric acid, was the most powerful explosive available, and was used by miners and construction workers. In its pure form the liquid was extremely dangerous to manufacture and to use: it was very sensitive to shock, and the slightest impact could set it off. In 1864, Nobel’s factory was destroyed by an accidental explosion, killing a number of workers and Alfred’s younger brother Emil. For several years, others had tried to make nitroglycerin safer and easier to handle by using various materials, such as sawdust, to absorb the liquid explosive. Over time, however, the nitroglycerin always leaked out and formed pools of unstable liquid, which then exploded. It wasn’t until 1867 that Nobel found a workable solution: he used a dry chalky type of soil, found in Germany and known as kieselguhr, to absorb the liquid nitroglycerin. This proved to be far more stable than other materials. The chalky mixture could be wrapped in paper tubes and stored without danger, and then could be safely detonated with a blasting cap that he invented. Nobel called it “dynamite”. Later, he found a way to use cellulose and nitroglycerine to form a jelly-like substance that he called “blasting gelatin”. And Nobel also patented an early form of smokeless gunpowder that he called “Ballistite”. In all, Nobel would receive a total of 355 patents during his lifetime. These inventions revolutionized the mining industry. They also revolutionized warfare, as high-explosive bombs and artillery shells came to dominate the battlefield. Nobel was himself a quiet loner who never married, kept to himself, and spent most of his time alone in his home in Sweden. Although the weaponry that utilized his explosives made him a very wealthy man, Nobel was a pacifist at heart and was always disturbed by the destruction his inventions caused. To console himself, he argued that his explosives were actually a force for peace, since they would make war so terrible that nations would no longer fight each other. “The day when two army corps can annihilate each other in one second,” he wrote to an antiwar activist, “all civilized nations, it is to be hoped, will recoil from war and discharge their troops.” That, of course, never happened. In 1888, Alfred Nobel’s older brother, Ludwig, died in Sweden. At this time, Alfred was living in France, but one of the Paris newspapers mistakenly thought that it was he who had died, and ran an announcement declaring that “The Merchant of Death is Dead”. Alfred Nobel therefore had the unique experience of reading his own obituary in the morning newspaper. It shook him deeply. The newspaper painted him as a greedy war-monger who had indirectly caused the death and maiming of millions of people on the battlefield. It was not the legacy that he had hoped to leave behind. For the next few years, the reclusive millionaire became even more isolated, as he became more and more depressed over the way he would be remembered. But then Alfred Nobel was motivated to do an extraordinary thing. In November 1895, he sat down at a desk and hand-wrote a new four-page will. In it, he left modest sums to his staff and relatives (he had no children), then declared that the entire rest of his estate should be invested to produce a fund from which five monetary prizes would be awarded each year to the people who “shall have conferred the greatest benefit to mankind” in the areas of physics, medicine, chemistry, literature, and world peace. “The prizes for physics and chemistry,” the will stipulated, “shall be awarded by the Swedish Academy of Sciences; that for physiological or medical work by the Caroline Institute in Stockholm; that for literature by the Academy in Stockholm, and that for champions of peace by a committee of five persons to be elected by the Norwegian legislature.” Nobel’s estate was worth about 35 million Swedish kronor (around $225 million in today’s US dollars). With his conscience apparently mollified, Alfred Nobel died, alone, in Italy in December 1896. His will caused immediate conflict and problems. His relatives sued to contest the terms, arguing that they were entitled to a larger inheritance. After a legal battle the will was upheld, but now Nobel’s vision faced practical problems. He had not bothered to actually ask the institutions he nominated to hand out the prizes if they were willing to do it, and some of them objected that it would incur too much administrative cost and effort. Eventually, a workable system was agreed to: a Nobel Prize Institute would be set up to oversee and administrate the estate, with responsibility for investing the money and generating enough interest income to fund the five prizes. These would be awarded each year by the various groups named in Nobel’s will. The science and literature prizes would be awarded in Sweden, and the Peace Prize would be awarded in Norway. 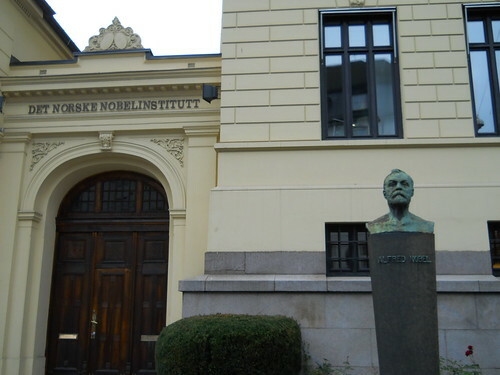 At first, the Nobel Institute was heavily tied to the Swedish Government (and also to the Norwegian Government after Norway became independent). Over the years those ties have been dropped, and today the Nobel Institute is a private foundation. The first Nobel prizes were awarded in 1901, with the most notable recipient being Wilhelm Roentgen, who received the first Nobel Prize in Physics for his discovery of x-rays. They were then awarded annually, although the awards were temporarily suspended during the First and Second World Wars. Today, a Nobel Prize is worth about $1.5 million. In 1969, a new prize was added. The central bank of Sweden, Sveriges Riksbank, donated a sum of money to establish the “Prize in Economic Sciences in Memory of Alfred Nobel”. Technically, it is not one of the Nobel prizes, but it has become popularly known as the Nobel Prize in Economics. The first female to win a Nobel Prize was Marie Curie, in 1903, in Physics, for her discovery of radiation. In 1911, Curie won the Prize for Chemistry, for her work on radium. She is one of only two people to win two Prizes in separate categories (and one of only four people to win twice). Only 43 women have won Nobel Prizes. After Albert Einstein published his 1905 papers on relativity, he was so sure that he would get a Nobel Prize for it that he made legal arrangements for the award to go to his ex-wife as part of their divorce settlement. In 1958, Russian author Boris Pasternak was awarded the Nobel Prize for Literature for his novel Doctor Zhivago, but the Soviet Government refused to allow him to accept it. Pasternak’s son finally accepted the award on his father’s behalf after the USSR collapsed in 1989. When Jean Paul Sartre won the Nobel Prize for Literature in 1964, he declined to accept it, saying that he did not feel it appropriate to award prizes for creative activities. In 1970, Soviet dissident Alexander Solzhenitsyn was awarded a Prize in Literature, but the USSR would not allow him to travel to Sweden to accept it, insisting that it be presented at the Swedish Embassy in Moscow instead. Solzhenitsyn then refused to accept the award, declaring that the Soviet demands were contrary to the very spirit of the Prize. In 1973, US Secretary of State Henry Kissinger and North Vietnamese Foreign Minister Le Duc Tho were jointly awarded the Nobel Peace Prize for negotiating the treaty ending US involvement in the Vietnam War. Kissinger’s award prompted protests over his direction of US military interventions around the world; Le Duc Tho refused to accept his award, saying that there was still no real peace in Vietnam. Some of the scientific prizes have been awarded for work that was simply wrong. In 1926, the Nobel Prize in Medicine was given to Johannes Fibiger, who had carried out experimental work to show that parasitic roundworms in the human body cause cancer. It turned out that Fibiger’s work was flawed, and roundworms do not cause cancer (or anything else). Another doctor was awarded a Prize in 1927 for some work on treating syphilis with malaria parasites–a wrong-headed dead end. In 1938, Italian physicist Enrico Fermi was awarded a Prize “for his discovery of new elements”. As it turned out, Fermi, whose work had involved bombarding heavy uranium atoms with neutrons, had not actually discovered any new element–he had unknowingly produced nuclear fissions. One notable person who never won a Nobel Peace Prize was Mohandas “Mahatma” Gandhi. He had been nominated several times, but the award always went to someone else. He was nominated again after his assassination in January 1948 (at that time the rules did not prohibit posthumous nominations), but the Nobel Committee decided that there was no suitable heir or organization that could accept the award on his behalf. Since then, the rules have been changed to prevent posthumous nominations.